The flat is located on the third & last floor in an ancient private palace built in the middle of the XIXth century, at the bottom of the Cimiez hill, in the Carabacel area. Situated 5 minutes walk away from old downtown and the bus station, 10 from harbour and Nice-Etoile mall, and 20 from the train station and Nice beaches, the flat takes advantage from an exceptional location to discover the many assets of this tremendous city : from ligure castels up to aristocratic palaces from ' Belle Epoque ', the city has many atmospheres, pieces of nice architecture, colors and art that should delight the ones who are looking for romantism and refinement. The flat will surely delight every mind sensitive to the charm of Belle Epoque, thanks to the building architecture made of retondes, the distribution of its rooms, its exposition, and its beautiful view of the Nice Castle park and St François tower, despite the old stairs and the wild appearance of the garden ! Sheets and linen can be provided for 20 Euros per person. Final cleaning is done by you or can be provided for 75 Euros. We ask for 500 euros warranty deposit at the entrance in the apartment. Non smoking apartment. The warranty deposit may cover any extra expenses related to furniture damage, phone bill, or any other. The refund of this warranty will be done the day the keys of the apartment are returned to the owner, including the possible deduction of the money due for reparations, including housework. A 100 € fee shall be applied in case of housework when leaving the flat. Quiet and old buiding:impossible to danse, jump, have parties, make noise in the building. Sheets and linen can be provided for 20 Euros per person. Final cleaning is done by you or can be provided for 75 Euros. We ask for 500 euros warranty deposit at the entrance in the apartment. Non smoking apartment. The warranty deposit may cover any extra expenses related to furniture damage, phone bill, or any other. The refund of this warranty will be done the day the keys of the apartment are returned to the owner, including the possible deduction of the money due for reparations, including housework. A 100 € fee shall be applied in case of housework when leaving the flat. Quiet and old buiding:impossible to danse, jump, have parties, make noise in the building. "This is a wonderfully characterful yet comfortable apartment in a stylish building with great views. We always enjoyed eating our meals in the main room, and found the kitchen well equipped. We found that the apartment keeps cool in hot weather, due to the nature of the building and as there is some breeze at that height. A great bakery and supermarket are close at hand. We enjoyed watching the baby doves in the palm tree close by. Nathalie was friendly. We'd love to return." "We truly enjoyed our stay at Villa Beau Site. There's charm to it - a lot of light and space, and beautiful views over the city from the lovely two balconies, where we enjoyed both our morning coffees and glasses of wine in the evening. 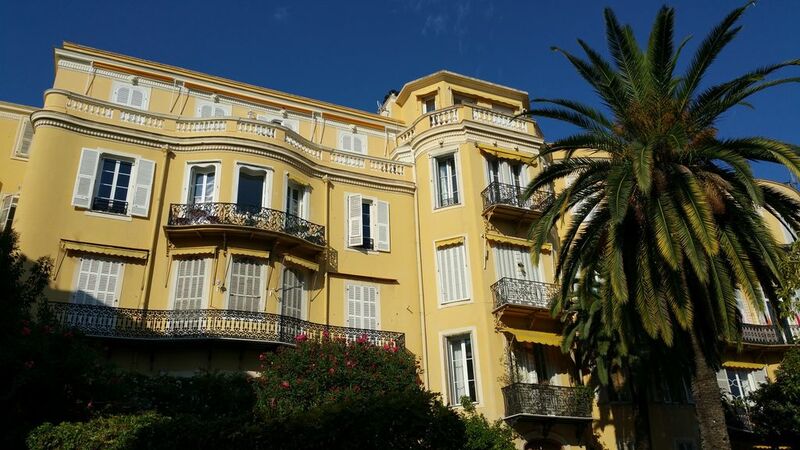 The neighbourhood with its Belle Epoque villas is very attractive. The flat works well for a family of 4 - we stayed there with our two teenagers who also truly felt at home. The flat is at a short walking distance from the old town." "Very quiet place, close to transport and city centre. Pleasing view. All the things needed in the kitchen." "The apartment was great, clean and well located. We had plenty of space and would certainly recommend it to others. The only problem was that hot water was only available in the mornings for showers, not in the afternoon/evening." A pure and romantic paradise in busy Nice in an old authentic building. We were overwelhmed by the hospitality of the owner, David. Furhtermore the small balcony is ideal for eating croissants in the morning and enjoying -nice- wines in the evening with a stunning view over Nice. (Text automatically translated) Follow signs Acropolis and Chamber of Commerce and Industry. Turn right at the foot of the sign for the hotel imperial. The building is the first face engaging in the rise. (palais Lascaris, Régina, arènes romaines, promenade des arts, Villa Beau Site, château de l'anglais, Villa Kerylos, parc du château, églises baroques, Vieux-Nice, …). Le train des Pignes : small touristic train going along the Var valley. Many stops possible in the medieval village of Entrevaux and beautiful walks possible from Anot. Le train des Merveilles : train going from central Nice station to Mercantour National park where you can see old paintings and beautiful high-mountain landscapes. La Villa Kerylos : an old-fashioned greek house built in the purest ancient greek tradition. Villefranche sur mer : a pictural village at the bottom of the cleefs of Villefranche, close to the sea.